The ground out at Plenty Park at Plenty was from a distance a fine field of green – however on closer inspection the wings in particular must be rated heavy. The camber of the field a little more traditional with the raised centre incorporating the cricket pitch. Unlike at Royal Park where the fields are flat; out at Plenty the players on the far side of the field lose their legs below the knees. In many ways – this is good old fashioned footy on what is less the outskirts of the suburban sprawl than in the past when the surrounding hamlets were farming centres with stockyards, general stores and stockfeed specialists. From early on the Irish were dominating clean possession and displaying superior skills and movement. Pretty well going to script by quarter time the Banshees had held the Liberty scoreless while accumulating 3.2.20 for themselves. Hard to pick out the individual best players – there was a level of rotation the illustrates depth that was beyond the means of the Liberty. By half time the situation had effectively duplicated itself – 6.5.41 to zero. The Liberty were trying hard – especially #17 Kaitlyn Mascher-Mace in the ruck; key defender and seemingly designated kicker #18 Elizabeth Even and the diminutive #25 Therese Tupper. #22 Brianne Thiesen was showing good marking skills and #27 Lissa Regets was hard at it. The Banshees were taking turns in being dangerous, with the defenders having little to do it was the forwards and mids dominating play. Resting ruck #1 Aimee Hazley snared the last goal of the half with a snap. Up forward #27 Sarah Rafferty had been a constant threat both scoring herself of centring to the front of goal and setting up opportunities for others including #15 Carol McGahon early in the 2nd and a goal square mark and goal to #30 Dempsey. The third quarter saw the Irish a little wasteful – peppering the goals against determined defence. The breeze was picking up and the Irish had the advantage. The Liberty were struggling to repel the Irish but managing a couple of forward forays. The goal drought for the quarter was broken in spectacular fashion when Irish #1 Hazley showed some flair with a right foot check-side from the forward pocket bouncing it through for a superb goal that brought the crowd to life. #3 Keatley soon followed up after Banshees star #11 Laura Corrigan again delivered long and deep where Keatley was able to catch the defenders out and snap truly. The third quarter really saw Corrigan assert authority and setting up play an while she didn’t manage a goal herself – was again instrumental when #24 Emma Treanor marked in the goal square and slotted the last goal for the term. By now – the Banshees had managed 3 goals per quarter and the Liberty might be reasonably pleased with that. The last term could have been all one way traffic but the Liberty had unfinished business. Perhaps to the surprise of most onlookers the Liberty were developing an appetite for the contest and were attacking perhaps even more than the Banshees. The desire for the underdog to find a goal certainly saw the interest sustained but when #23 Gill Behan broke clear and ran into goal it would have been all too easy to write off the plucky Americans. As the clock ticked down though there was one last might effort and when #13 Laure Kwoka marked directly in front the kick from #8 Heather Serpico – it was suddenly all eyes on the set shot. With a wall of Banshees trying to distract; Kwoka calmly went back and slotted the goal. The jubilation on display was akin to a match winning goal – but this was the underdog – and scoring a goal against such quality opposition was reason enough for happy beers. With no time on the seconds continued to count down and the siren sounded before the ball could be bounced. It had been cut tight – but the Liberty coach Leigh Barnes could be justifiably proud. Having had the bye in round 1 and been held scoreless in Round 2 against the highly fancied Canadian Northern Lights – this had been their first scoreboard impact of the tournament. The Banshees too had done the job they had to do. They have sights set a little higher but when the two sides linked arms in a large circle midfield the camaraderie on display again was as great a testament to the tournament as anything. 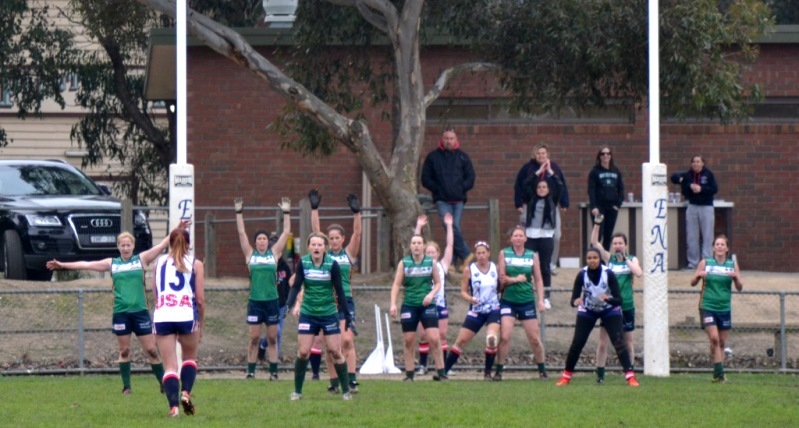 Footnote : It should be noted that a couple of the Banshees play at Diamond Creek – team mates were on hand to watch and struggled when realising that they could just call out “Go Irish” to their regular team mate Laura Corrigan. Suddenly they were trying to recall her name. Such can be footy clubs – years can pass with players known solely by their nicknames.